NIBBLE. 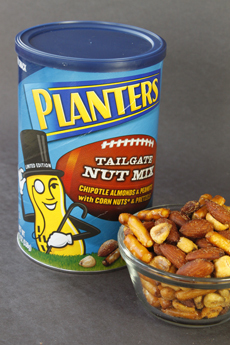 Chipotle almonds and peanuts, corn nuts and pretzels: We couldn’t resist nibbling through an entire large container of Planters Tailgate Nut Mix—tossing some of it on salads and polenta. Our mix of choice is one of a series of seven limited-edition nut mixes that includes honey-smoked Tailgate Almonds (another favorite), Pumpkin Spice Almonds (very nice for Thanksgiving nibbling and garnishing) and Winter Spiced Nuts (our can was a bit underspiced; we’d like more cinnamon and clove). There’s also Holiday Nut Crunch, with peanuts, chocolate-covered peanuts, raisins, chocolate candy pieces (like M&Ms), almonds, cashews and dried cranberries. Alas, we couldn’t track that one down locally, so we’ll have to order it from Amazon. Two other sweet mixes are Brittle Nut Medley and Crème Brulee Almonds. The former didn’t have enough nut brittle to interest us; the latter was too sugary (but O.K. to sprinkle on ice cream). We’re off to load up on Tailgate Nut Mix and Tailgate Almonds. We don’t tailgate, but we do go out of our way to pick up delicious, healthy snacks. The USDA recommends an ounce of nuts daily as a heart-healthy snack. The nuts on the approval list include almonds, hazelnuts, peanuts, pecans, pine nuts, pistachios and walnuts. These particular nuts are recommended because they contain less than 4g of saturated fats per 50g. Seeds such as flax seeds, pumpkin seeds and sunflower seeds may offer the same heart-healthy benefits. Note that walnuts and flax seeds have a significantly higher amount of heart-healthy alpha linolenic acid compared to other nuts and seeds. This plant-derived omega 3 fatty acid is similar to that found in salmon, which many studies show lowers total cholesterol and LDL cholesterol (bad cholesterol) levels.